The foods you eat provide the raw materials for energy production and body function. Your body reacts differently to the foods you eat based on their chemical composition. High-carbohydrate foods provide a good source of energy. These foods are especially beneficial if they are also low in sugar. High carbohydrates does not necessarily mean high sugar. Several foods satisfy these requirements while providing important health benefits. Carbohydrates are classified into either simple or complex carbohydrates. The designation refers to how easy it is for the body to chemically break down the food. Examples of simple carbohydrates include fruits, juices and baked goods. Complex carbohydrates include brown rice, vegetables and whole grain foods. The chemical difference lies in the starch and fiber content of some foods. Chemically, the bonds of these foods are more complex, which accounts for their longer digestion time. One way to measure the effects of high-carb, low-sugar foods is through the glycemic index, which reflects a food's effect on blood sugar. A one-cup serving of cooked barley, for example, contains 44 g of carbohydrates. Yet, its sugar content is only 0.44 g. Its GI is 25 on a scale of 1 to 100, making it a low glycemic food. 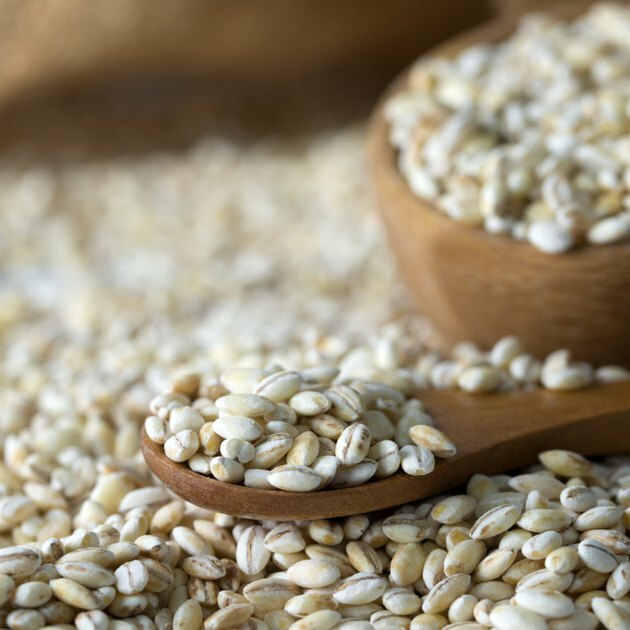 You can eat a serving of barley and feel sated long afterward because of the added time the body needs to digest its starch and fiber content. Other examples of high-carb, low-sugar foods include cooked black beans, lentils and bulgur. All of these foods share the same characteristics of having high carbohydrate counts and low GI figures. Another factor affecting how your body processes these foods is fiber content. Fiber can be soluble or insoluble. The distinction lies in whether or not the body has the enzymes necessary to chemically break down these foods. Plant cells are composed of a complex compound called cellulose. The human body lacks the enzyme to break these foods down. Consequently, it cannot use some of the sugars contained in these foods. Most vegetables are insoluble fibers. Eating high-carb, low-sugar foods provides health benefits. The American Heart Association encourages you to include whole grains in your diet due to their cholesterol-lowering effects. These effects are greater with soluble sources of fiber, including oats and barley, explains a 2010 study by Pennsylvania State University. Because they are low in sugar, these foods will help keep your blood sugar stable and prevent spikes or dips in your glucose levels. If you are diabetic or sensitive to the effects of glucose, you may find these foods a better choice than sugary foods.